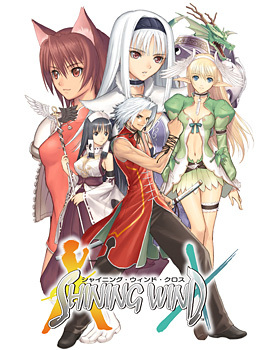 Shining Wind Cross is a simulation RPG game exclusively for mobile phones . Co., Ltd. Sega mobile site, which provides management · ★ Puyo Puyo! Sega one of the content of the application. It is assumed that the time in the work is between Wind and St. Luminous School of Light Storm Festival. The mercenary Knights who keep the Endeas peace Soma who became a member of Weiss Ritter was pursuing an unidentified monster . Those who received the request of the king Rune Bell, they know the existence that they collaborate with the dark elves and claim themselves as the Black Dragonese. Weice riterters confront the Black Dragon's ambitions to crush them. "Silver moon swordsman". From the encounter with Mao Enidius is blown and becomes a heart swordsman. It is thick-hearted, passionate about the behavior and appearance that looks frivolous. "Beast of Flames". A Beastman who is the head of Vice Ritter and a half of a human. Bright and cheerful personality at any time. The daughter of the monarch Kingdom King Vestia. "Daughter of the God of the Forest". An elf girl who is bright and curious and wanted to thrust his neck anything. I can hear the voice of the spirit . "Witch of Ice Blade". Princess of Runevere . Intelligent and calm personality. She seems to be cold at first sight, but her inner person is a gentle personality. "Shrine maiden sealed". Holy dragonprotect the temple of the shaman . There are places that are humble and miserable, but the core of the mind is strong. "Protector of the Ryu armor". Guardianguardian of Ryuna . A strong sense of justice is strong, and if you want to protect those you love you are also willing to throw your own life. "Pretty light flame use". A grandfather of Earl of Rodelia, a best friend of Blanc Neige. I use fire magic but my arm is immature. "Afraid fist fighter." A blind fox ring family (fox beast man ) fighter whochases the Black Dragon Order . It seems I hate heart swordsmen. "Strongest human horse knight in history". Centaur is the head of the Runevale Order of the Order. One of the four brave men who saved the world, a thick samurai in Tadayoshi. Centaur. One of the Holy Knights and Castor's twin brother. Centaur. A unusual bow knight at the Holy Knights. An adventurer of the Wolf Ring tribe (Wolf Beast Man ) who follows the mystery of ancient civilization . Crow's birdman who is one of 12 strongest warriors of Vesty Kingdom "Beast King Twelve". Participate according to the request of Mao, the princess. Even under construction, one of the few flying characters can use wind-based magic. Kingdom of Vestia Centaur is one of the strongest 12 warriors "Beast King Twelve". Participate according to the request of Mao, the princess. A paladin where thunder magic can also be used. A fairy who was acting with Cupid, one of the four brave men. After joining Elf talks on behalf of Elwin, join the party. Although initially incompetent because of its small body, it is one of a few flying characters even in the works, and as soon as it grows it will be able to use the extensive recovery magic "aura" and the magic of fire and lightning to the maximum level. The leader of the dark elf triplet with a mask that appears in the work. It is aiming for the resurrection of the devil king sealed with a mask of darkness by one of the masterpieces of this work. One of the three dark elves with a mask. Inside, I look down on the other two people. One of the three dark elves with a mask. It has a strong hostile towards humans, but also has a side to love and cherish flowers and birds. A mask with a will that is the masterpiece of the same work that appeared in Shining Tears . It is also one of the masterpieces of this work. Currently it is taking over the camsin's best friend Hakubi body. Rasubosu of this work. Resurrected by Darles and the darkness of the dark mask. Another character from the devil king Zeon that appears in Shining Force II. Vice Ritter 's dealer merchant dwarf . We make use of Dwarf 's network and sell items at the base (Honjin) and serve as a guide in a dangerous area. King Ruben Bell, Broanage 's older brother. A warrior with a strong sense of justice and an excellent warrior. See the shining window . Originally the Shikidia Birthday Orchestra. Mao is the current head coach. See also Shining Tears . Elf tribe to the dark. A religious organization worshiping the Black Dragon. It is in the position opposite to the sect where Ryuna belongs. Preparation screen before battle. Here, select conversation between Soma and other characters, purchase and equip items, set up characters to go out, and Sowa's heart sword partner on the next map. A sword to be a weapon of Soma. He can not equip ordinary weapons, but by selecting a partner to join in the next map at Honjin, equip the sword with its own special skill and ability. Also, the selected special partner will be able to use its own special technique. There are two kinds of techniques that can be used: "single technique" used alone, and "link technique" which exerts an effect on the scope encompassed by two members of Soma and a partner. Mao: Explosive blowing leg ... concentrated enemy intensive attack. Holy Beast Temporal Wave ... Recovery HP of the surrounding view. Beast king fierce camp ... Fire attack on enemies within range. SOMA: Thunder Blade ... Concentrated attack on enemy one. Elwin: Wind shot ... penetrate through enemies on the line. High wind ... the quickness of the ally within range, the defense up. Slow Bind ... the speed of the enemies within the range, the defense down. SOMA: Cold Strust ... Thrust through enemies on the line. Blanc Neige: Poison Mist ... Poisons enemies within range. Ice brace ... Ice attack on the enemies within range (rarely adds to sleep). Poison snow ... infringe enemies within the range with poison. SOMA: Saint Seiyu ... concentrated attack on one enemy attack (rarely asleep addition effect). Ryuna: Spirit Guys ... attacks a wide range of enemies (rarely adds magical seal). St. Dragon's Waves ... HP recovery of allies within range. Cure aura ... all state abnormalities of the surrounding friend, HP recovery. SOMA: Takeshi Yuzuru ... concentrated attacks on enemy one. Lazarus: The bomb drone waves ... attack through the enemies on the line. Ryujin Kanemo ... ... Attack power of neighboring friends and defensive up. Inverse scales ... attack enemies within range. Values ​​displayed only for characters that become cardiac swords partners. Increases depending on options at conversation with partner characters in Honjin and action content in battle map. As this value increases, not only does the performance of the sword of Soma increase, but also a special conversation with partner character can be generated in Honjin if it meets the fixed value condition. This thing is like... old. Why post about it? Bit of a contradiction on this site, no? But anyhow thanks for your input. If anybody can help me understand a clear view of the story in it's entirety it would be appreciated. Last edited by rid1ey on Wed Nov 14 2018 10:15am, edited 1 time in total. wow, I never see video footage of this game before, and I searched so much. Thank you very much! You know if this possible to find gameplay of shining Road and shining exa mobile? This is a fusion of classic and modern shining. They just reutilized the town sprite and some enemies of shining gaiden. edit: I really want to see the unique artwork of this game. some characters are exclusive like the masked enemies and castor and polux, the twin centaurs. I never saw their faces. Who is the uploader of the videos? Some japanese speaker could message him asking for more. Yeah the videos are cool - not much out there to find on the Internet unfortunately. DiegoMM wrote: wow, I never see video footage of this game before, and I searched so much. Thank you very much! You know if this possible to find gameplay of shining Road and shining exa mobile? Actually, if it's possible to contact the uploader to ask him to do more video, he would be also able to upload Shining Road and Force Exa gameplay as the 2 game are available in the same service. Castor and Polux were character from Shining Tears or Wind, the masked enemy were exclusive back then but they were reused in 3D in Shining Blade, they are the base member of the Dark Dragon cult. It's really frustating because the game are really part of the Tony Shining Canon, it's not a side story. You seem to know a lot about the (mobile) games despite such sparse information available... Where did you find all that out? Would be great if we could compile it all together. The only centaur in the twelve beast is Arthur. He is a reference to arthur in sf1 and 3, but now he has black armor. Sadly he just appear in one cutscene in Tears. Now we can see all the artworks. Castor and Pollux are super generic. Someone can confirm if the grey statue thing is "Zeon"? So no one is Zeon there? Edit: Also, this say Bakuto is a ninja? Black Knight Arthur is one of the 12 Kings of Bestia, a Knight who casts the magic of thunder! He supports the Weiss Ritter by order of the King. He is a Centaur Paladin who uses both spears and lances. He has a major mastery of Spark magic.